Designed by Robert Trent Jones, Castelconturbia Golf Club opened for play in 1984 to a standing ovation. It’s located about one hour’s drive to the north of Milan and it has bags of Italian style. Castelconturbia is one of Italy’s most challenging courses and with three nine-hole loops there are a number of playing combinations. If you want to play the Italian Open course, you’ll need to play the Blue and Yellow nines (the Red course makes up the 27 holes) and, if you want to score well, you’ll need to have some accurate approach shots in your armoury. The Castelconturbia greens are huge, and very difficult to read and they can be cruel with their pin placements. Let’s hope the weather is kinder for your visit than it was for the 1998 Italian Open, which saw José Maria Olazábal emerge victorious. The Open was reduced to 56 holes after torrential rain brought the final round to an early conclusion. With some great distant mountain views to drink and a challenging, strategic and varied course, Castelconturbia should be added to any serious visiting golfer’s itinerary and, what’s more, the club is friendly and the facilities are pretty good too. In many ways, Castelconturbia is reminiscent of The Wisley, both come from the same design stable, both have three loops of nine holes and even the clubhouses are remarkably similar. Thankfully, Castelconturbia is open to visitors. Hurrah! Whilst staying at the nearby Bogogno, my partner and I decided to take the opportunity to play the 27 holes at Castelconturbia. Being so highly ranked we were expecting an excellent course in great condition. Sadly we were extremely disappointed. Disregarding the significant amount of repair and drainage work around the course, the bunkers were in terrible condition, being several days since they last saw a rake! The course itself was also fairly uninteresting compared to the excellent Bogogno courses close by. I have played a few Robert Trent Jones' courses and they all seem to be similar in character - large, American style courses, lacking any consideration for the local surroundings. I cannot understand why this course is ranked so highly - in my opinion neither the design of the course nor it's condition were anything above an average public course in the UK. 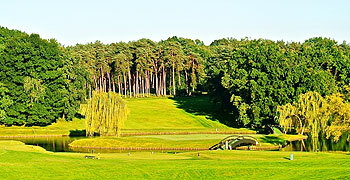 A fantastic golf experience on one of the top ranked golf courses in continental Europe. The location is breathtaking, three nine hole courses surrounded by secular trees, streams and small lakes. 27 holes of pure challenging golf that gently follow the natural undulations of the land fitting harmoniously into the lush and pristine countryside with spectacular views of the massif of the Mount Rosa. The Yellow (3,081 mt par 36) and the Blue (3,121 par 36) courses are usually combined for the main events held at Castelconturbia. The 348 meters par 4 7th of the Yellow course is Castelconturbia's signature hole and is considered to be one of the greatest golf holes in the world. A spectacular dog-leg left hole with trees running down both side of the fairway which slopes gently downhill and the green located on island in the middle of the lake with breathtaking views of the clubhouse and Alps in the background. The Red nine (3,330 par 36) are equally challenging and fun to play featuring maybe the best three final holes of the entire course: the 405 meters par 4 7th, a tough tree lined par 4 that demands a long, straight tee shot, the 132 meters par 3 8th, a downhill par 3 to a small green with water on the left, and the 480 meters par 5 9th, an uphill par 5 where the long and narrow green is well protected by a crown of bunkers. Play this holes before sunset and you'll be amazed by the beauty and the colors of the course.